Recently Microsoft announced Azure Event Grid, a highly scalable serverless event driven offering allowing us to implement publish and subscribe patterns. Event driven scenarios are becoming more common by the day, which means that we see these type of integrations increasing a lot as well. A lot of times applications will define their own message formats for their events, however, with the recent announcement of native support in Azure Event Grid for CloudEvents our lives should be made a lot easier. CloudEvents is a standard for working with events accross platforms, and gives us a specification for describing event data in a common way. This will allow any platform or application which is working with events, to implement a common format, allowing easy integration and interoperability, for example between Azure, AWS and Oracle. The specification is still under active development, and Microsoft is one of the big contributors, especially Clemens Vasters, Lead Architect on Azure Messaging Services. When implementing software, it’s always a good idea to follow existing patterns, as these allow us to use proven and reliable techniques. The same applies in integration, where we have been working with integration patterns in technologies like BizTalk, MSMQ etc. These days we are working more and more with new technologies in Azure, giving us new tools like Service Bus, Logic Apps, and since recently Event Grid. But even though we are working with new tools, these integration patterns are still very useful, and should be followed whenever possible. This post is the first in a series where I will be showing how we can implement integration patterns using various services in Azure. Yesterday Microsoft announced their newest service on Azure, and it is called Azure Event Grid. With this new service, we now have event based serverless routing, from any source, to any destination. Of course, we all love integration, and Azure Event Grid brings a whole new world of possibilities. The service is currently in public preview, and we already have various publishes and event handlers to our disposal, and more will be rolling out over the coming months. In the end, expect every service within Azure to have a connection to Event Grid. In this post, I will show how we can use Visual Studio to write Azure Functions and use these in our Logic Apps. Azure Functions, which went GA on November 15th are a great way to write small pieces of code, which then can be used from various places, like being triggered by a HTTP request or a message on Service Bus, and can easily integrate with other Azure services like Storage, Service Bus, DocumentDB and more. 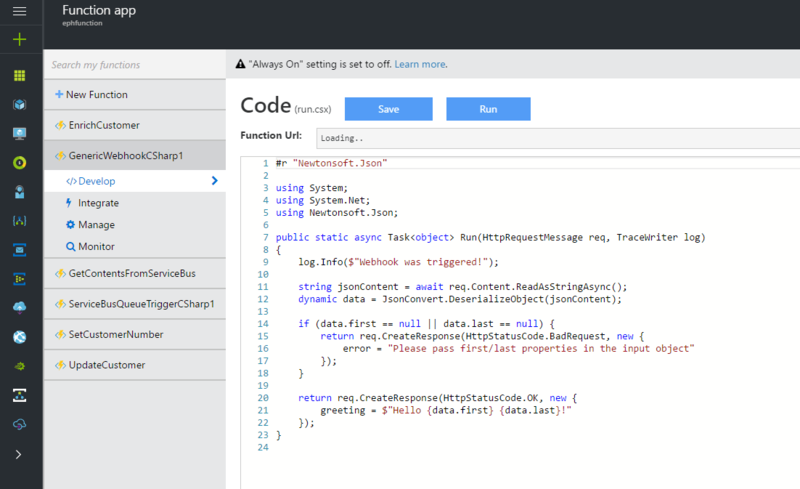 We can also use our Azure Functions from Logic Apps, which gives us powerful integrations and workflow, using the out of the box Logic Apps connectors and actions, and placing our custom code in re-usable Functions. Previously, our main option to write Azure Functions was by using the online editor, which can be found in the portal. However, most developers will be used to develop from Visual Studio, with its great debugging abilities and easy integration with our source control. Luckily, earlier this month the preview of Visual Studio Tools for Azure Functions was announced, giving us the ability to write Functions from our beloved IDE. 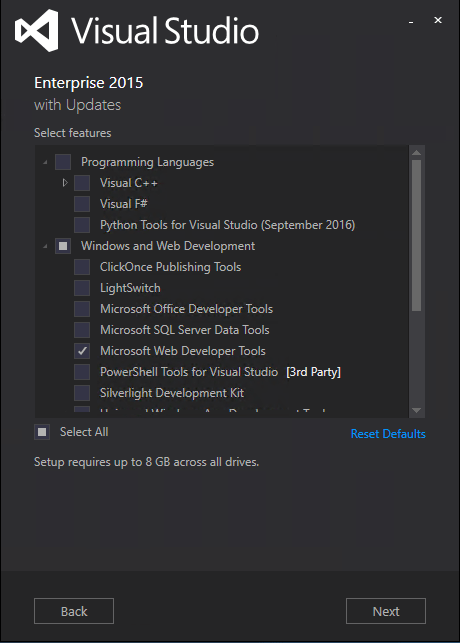 For this post I used a machine with Visual Studio 2015 installed, along with Microsoft Web Developer Tools and Azure 2.9.6 .NET SDK. Last week I attended Integrate 2016 in London, the biggest Microsoft integration event this year, organized by BizTalk360. The outcome was almost 400 attendees, and there were sessions from the Microsoft Product Group, industry leaders and MVP’s. 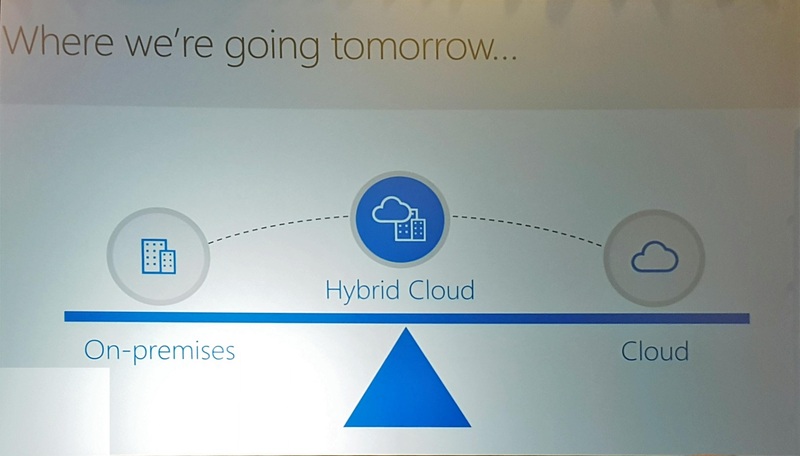 The major take-away I have from the event, is that Microsoft now has a great vision on the future of integration, which I felt was missing the last couple of years. Now though, they recognize that even though the cloud is a great asset, on premise is not going away for a long time. Also Microsoft has now officially announced that their on-premise integration solution will be BizTalk, which has not been getting a lot of love lately.